Ranked as the number one national free agent by the Canadian Football League (CFL) as their free agency opening approaches on Tuesday, Feb. 12, Laurier alumni Kwaku Boateng received a contract extension by his current team, the Edmonton Eskimos, on Friday, Feb. 1. Boateng was given a contract extension through 2020 with a $50,000 signing bonus as well as $175,000 in salary, with another $30,000 coming in 2020 on top of his wages to give a $380,000 total for his contract. This is the largest jump in salary for a Canadian on an entry level deal in the CFL. “It’s a good feeling, it’s obviously nice to stay with the team I was lucky enough to be drafted by, I like the organization and I like the fans, they welcomed me with open arms, so it wasn’t a tough decision for me to sign that piece of paper,” Boateng said. Avoiding a sophomore slump, Boateng over doubled his sacks this season with nine, tallying only four in his rookie season. He also improved his defensive tackle stats as he made 26, a jump from 21 in 2017. He also was in two less games in 2018, playing in 18 his rookie season and only 16 this year. Drafted 41 overall in the 2017 CFL draft, Boateng has quickly become one of the top defensive ends in the league, ranking sixth in the entire league for defensive sacks despite missing out on two games this season, no surprise as he holds Laurier’s all-time sack record. “It feels rewarding, the best part about it is that it shows that hard work really pays off, patience is a virtue and it’s something that I think is lost sometimes. If something fails at first, many people want to quit, so for me it means something more than just the dollar value,” Boateng said. “I’ve always been a very competitive individual, and I think [getting drafted late] just sparked something within me, and it forced me to really play, I had this chip on my shoulder and I’m going to play with that for the rest of my career,” Boateng said. Already making a name for himself just two years into the league, Boateng has been invited to work out with National Football League teams like the New York Jets, Los Angeles Chargers, and New York Giants. Despite the attention, Boateng is focused on his current squad, not a potential future. “If that opportunity presents itself once again once this contract is over then I’ll dip into it, but right now I’m focussing on winning Grey Cups and winning championships with the Eskimos,” Boateng said. 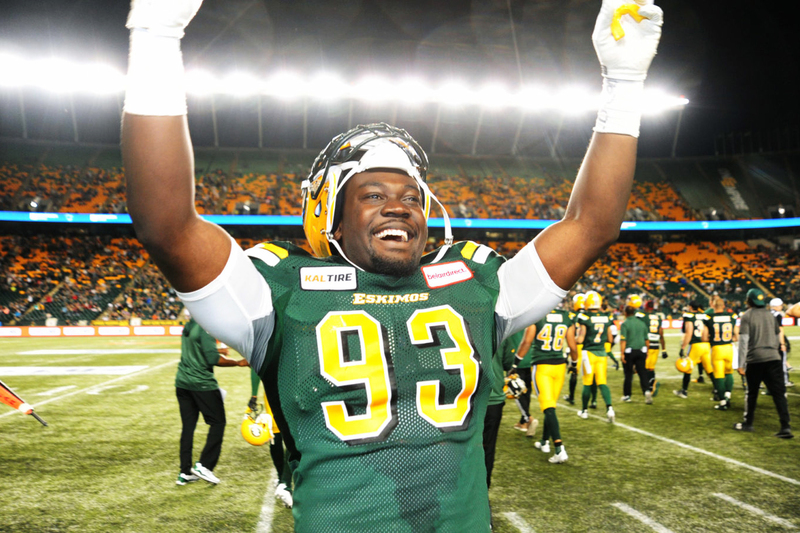 Boateng had the most sacks for any Canadian defender during the 2018 season, proving that homegrown talent is thriving in the CFL, receiving the Eskimo’s Most Outstanding Canadian Player award for his accomplishments, all the more reason for him to receive his massive contract from the Eskimos.